This treatment focuses on relieving tired, achey lower legs & feet. Fantastic if you are standing or driving long hours. This treatment is the antidote! To begin with your feet are soaked in a warm coconut wash foot bath. 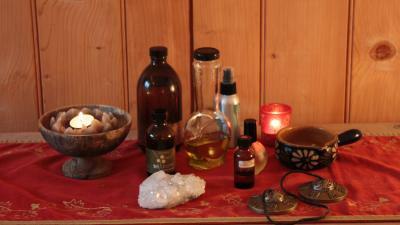 This softens & relaxes the nervous system & skin. It opens the pores ready to recieve organic oils to the underlying tissues. As you lie comfortably on the massage table, warm oils & various massage techniques are used to release pain & stored tension. The upward flow of blood (caused by your leg being held in a supported position) relieves varicose veins and removes pressure build up & puffiness. The legs & feet are left feeling refreshed, invigorated, light & new. Testimonials for this therapy will appear here as soon as they've been added.